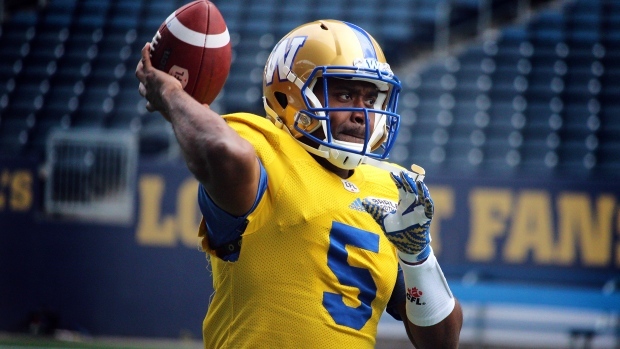 WINNIPEG — Kevin Glenn's second stint with the Winnipeg Blue Bombers came to an end Friday as the CFL team announced it has released the veteran quarterback. Glenn, who spent five seasons with the team from 2004-08, was re-acquired last September in a trade with Montreal to serve as a backup to Matt Nichols. "The decision was made to grant Kevin the opportunity to explore other options after we informed him we weren't going to be able to immediately come to an agreement contractually," Blue Bombers general manager Kyle Walters said in a statement. "Given Kevin's longevity and veteran status in our league, we felt it was appropriate and the right thing to do given the circumstances." Glenn, 37, appeared in just one game for Winnipeg last season, completing two of four passes for 16 yards. In nine games with the Alouettes, he completed 222 of 314 passes for 2,547 yards and 13 touchdowns with 11 interceptions. The five-foot-10 205-pound Detroit native made his CFL debut in 2001 with the Saskatchewan Roughriders. He has also played for the Hamilton Tiger-Cats, Calgary Stampeders and B.C. Lions.